Feeling a little sluggish these days, it’s time to stop the overindulging that’s derailing your diet and get back to a healthier routine. If you have spent the last little while indulging in too many brunches, calorie-rich food, sweet treats and too much bubbly, now’s the time to stop – it’s not too late to get back on track, after all beach season is here! Relieve your weight gain and your tight jeans, by incorporating these quick fixes. This is by no means the answer or replacement to your regular healthy diet and workout plan, but it’ll help you get back on track a little bit faster! Juicing is a great way to get a whole lot of good-for-you nutrients, antioxidants, vitamins and minerals all in one cup. Although you might be hesitant to try juicing, it’s quite possible to get all the nutrition you need to function with just juice – especially if you’re carrying a little extra weight. Try juicing for three to a maximum of five days post food binge. 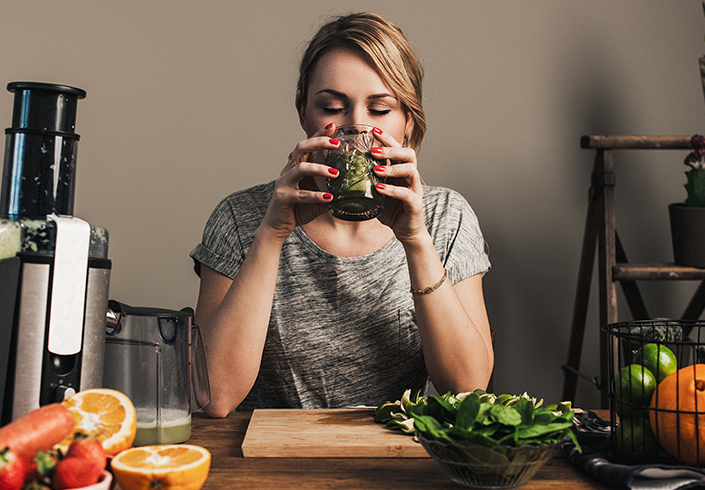 If you have been eating plenty of the food you shouldn’t be eating, a juice cleanse can help revitalize your system. Juicing has been shown to help increase antioxidant status in the body, which means you can reduce any inflammatory response caused by eating food you shouldn’t have been, recover faster and fight off infection easier. You can create your own juice blends with green vegetables such as spinach and kale, along with higher water content veggies and fruit such as cucumbers, beets, oranges, lemons and grapefruits. Not sure you want to juice all day? Introduce one or two juices into your regular diet plan or try making a fruit and vegetable smoothie adding in a scoop of Greek yoghurt, avocado or whey protein to make a creamy blend. Avocados are a rich source of glutathionine – a super antioxidant that can help repair the body, while whey protein and yoghurt can provide a rich source of protein. Water is important for keeping our digestion system moving, keeping us hydrated and our metabolism functioning optimally. Drinking water helps flush out toxins in the gut that can cause inflammation, or even hormonal imbalances. Drinking more water can also keep us feeling energized and can help reduce hunger between meals. Having a hard time drinking enough water? Try making simple water infusions using slices of cucumber, chopped mint, lemon, orange, grapefruit and strawberries. Water infusions don’t add calories, but instead add a hint of flavor that can make it easier to drink water. Drink at least three to four liters of water daily. If you have been eating a few too many delicious carby dishes or desserts, you’re probably eating more carbs than you can burn off. Excess carbs get stored as fat, but when we eat fewer carbs the body accesses that stored fat as fuel. Not to mention carbs get stored in the body with water. Carbohydrates are stored as the compound glycogen, and each gram of glycogen is bound to 4 g of water! Yikes. As a result, most people who go on a lower carb diet will notice a fast loss of water in their first few weeks, but also fat! If you want to get rid of some of that extra water weight you’re holding on to and kick start your fat burning, reduce your carbohydrates for a week or two. Eating a lower carb and higher protein diet can contribute to faster weight loss and a better body composition – meaning more muscle and less fat. The higher your lean muscle mass, the higher your metabolism. Instead of going no carb, lower your carb intake to 20 percent of your daily calories. This is enough to ensure your body gets what it needs to fuel workouts and daily activity while still being enough to lose weight. Choose high fiber carbs including green vegetables like broccoli and kale, non-starchy root vegetables like squashes, sweet potatoes, and whole grains such as oatmeal and brown rice. Vegetables such as asparagus and cabbage contain phytonutrients that act like natural diuretics, which can help increase your kidney’s ability to transport toxins into the urine, while also helping the liver cells recover faster. Veggies are also full of fiber, which can help clear the digestive track too. Cruciferous veggies like cauliflower, broccoli and kale can help cleanse and remove toxins including estrogenic metabolites. High levels of estrogen can result from eating a low fiber and low veggie diet. If you’ve been skipping the greens in favor of more stuffing and potatoes, now’s the time to start filling your plate with the good stuff. When hormones are balanced, inflammation and bloating reduces, and your metabolism and fat burning increases. Not sure how to get in more veggies? Add kale or asparagus to your breakfast omelets, have a green salad at lunch, or try sautéed spinach or roasted broccoli as a side dish with meat. Remove starchy carbs like pasta with veggie noodles like shredded cabbage, spaghetti squash or zucchini noodles. Sneak veggies into sauces, or mashes and purees – cauliflower with white potato, sweet potato with pumpkin. The possibilities are endless. Obviously, one of the first things you need to do when it comes to getting back on track, is to get back to your regular workout schedule. If you have missed workouts, specifically cardio sessions you could be feeling a little sluggish. Cardio not only burns calories, it also helps rid the body of water via sweat and also increases the release of adrenaline and feel good endorphins that can lift your mood and help you feel better about your current fluffy situation. For your first week back after a hiatus to your routine, up your cardio workouts by performing longer and more intense sessions. Try performing interval training on a treadmill or bike by switching between intervals of high and low intensity. In addition to cardio, don’t forget to also include weight training. Strength training helps build muscle, which in turn helps increase metabolism. Aim to work out a minimum of three times per week, with a mix of both cardio and weights. Need some motivation? Consider hiring a personal trainer or enrolling in a group session to keep you committed. Remember 3500 calories equals one pound of fat, so try to burn at least 500 calories per workout session.